Group discounts are the best way to save money and Groupon has captured that niche. It has become the hottest startup website. If you want to build your own group discounts site like Goupon or a site like LivingSocial.com, you can easily build one with Wordpres. Start your own group buying website showing a deal a day. With Wordpress there is no need to buy expensive Groupon clone scripts. Wordpress software and platform is free. Install WordPress and get this WordPress Groupon Template – Daily Deals. Click here for more details about this template. Full featured notification emails to buyers, sellers and admins. Featured deals on homepage + Category-wise deal widget. 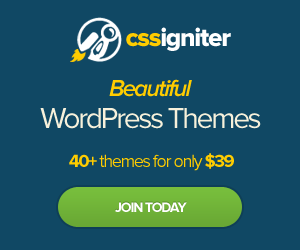 One Click – Auto install of the theme. Custom built, dynamic widgets that you can use multiple times. 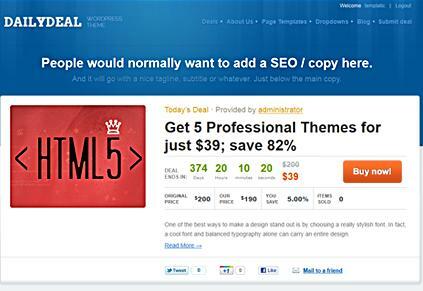 This is the best Wordpress Theme you can find for a Daily Deals website. Daily Deal is a complete theme with built in functionality for submitting, displaying and buying deals. Save time, money and hassle, create your daily deals website easily with this Wordpress Theme. Can anyone make this groupon clone here? I’m interested – but broke. Are you having problems creating the Groupon site with Joomla? Let me know what errors you are getting and perhaps I can help. How much customisation is possible with this template? Such as changing colours, fonts, size of components on the page, adding links to facebook/twitter, a map of the deal location, etc. Thanks for such informative info so far! I checked and there are 2 different color templates available. Once you install the template there is be a css file you can modify to change the theme colors other than the colors provided. If you want to change the font and font size there is a Groupon Template style switcher you can check out on their site here. Size of the components I believe is fixed. You can add links to social networking sites as well such as facebook, twitter, stumbleUpon etc – you can see example of that here. Awesome! Many thanks for your replies Elaine! I am new to Joomla and installing/using templates. I was able to get Joomla and the template installed. However I can’t figure out how to get the site to look like the examples. Do you have any insight as to where I can go to learn how to setup the menus for the cities, add deals, google maps etc. Did you purchase the Deal Plazza from TemplatePlazza? If so, there is a Groupon Template support forum you can read or post up on here. If you want (and trust me) I can take a quick look at it. You can send me your site details to my email address – me at enzolina dot com. I did buy it from TemplatePlazza, unfortunately the forums are not that robust. I am slowly figuring this out, I think its just a matter of research, try, research again and so on. I would certainly send you the site but I have it locally hosted and don’t know how I would get it to you. Yah, once you get it uploaded to a web hosting I can take a look at it. If there is a specific question you have about Joomla and your Groupon template, please let me know. You can also check out Joomla.org forums if you need additional help. can business partners’ employees login and edit deals from their company? Or only admin can add, edit, delete ,… deals and vouchers? This theme does not allows business partners or other companies to login to add/manage their own coupons or deals. If you are looking for that feature, I would recommend using WordPress CouponPress theme from PremiumPress, see my post here. It has a very extensive backend and other business partners can login and manage their own coupons or deals, you can sell advertising spots, set listing prices, view monthly sales charts and much more features. This WordPress theme will basically make your website look like Savings.com. Is there anything good for the WordPress CMS ? I haven’t found a Groupon Premium WordPress theme yet. Believe me I’m searching everyday. I’m waiting for a good one to come out too. I will post the WordPress theme up for sure when I find it. and i do not have any programming background. I read your comments and I just wonder if I pay one of the Silver, Gold, Developer membership in the templateplazza.com can i create mysite. Hi Reza, you can purchase the Silver membership that includes 4 months of unlimited support and to download the deal plaza template. After you purchase a web hosting you can upload the file to your account, unzip and install the quick version. You can read up on the post I created on the cost to create a Groupon site here. I can also post an article about quick installs later when I return from my trip. Hope that will help you too. Uploading and installing the Deals Plazza template from TemplatePlazza to your webhosting is really simple. If you have problems contact the TemplatePlazza support team and they will provide you will instructions on how to do it. If you ask me to do it for you, I will charge a fee. So the best (and cheapest) way, once you purchase the template is to contact their support team. Their support is completely free. Please refer to the TemplatePlazza support forum – there is a pre-sales forum that can help you answer those questions. Sorry I am not able to help you further with their template. I’m looking into Deal Plazza. Overhere in the Netherlands for online business credit card payments and PayPal are not very popular. The most common used and popular payment method in the Netherlands is ‘iDEAL’. It is more or less a ‘bank transfer’ method where the transfer slip is pre filled by the webshop (payment amount, order info, bank account seller). Is there anyone who is familar with the issue whether you can implement other payment methods to Deal Plazza instead of PayPal? Or is Deal Plazza functionality depending PayPal functionality / integration? Kind regards and many thnx for helping me out. Hi Marcel, That’s a tough question. You will have to contact TemplatePlazza. There is a forum for pre-sales so you can ask questions before you actually buy. Sorry to be deferring you to them, but they can probably answer your questions much better than I.
I was looking through the Joomla 1.5 extensions and found the cciDeal extension. You can install the iDeal extension for Virtuemart to accept payments in the Netherlands. You can find this extension in the Joomla.org extensions directory. Thank you for your reply. I will try to ask the same question there. Did you post an article about quick installs dealplazza ? I bought the templateplazza silver membership but i don’t know how to install/upload the template. I believe the Deals Plazza is compatible for Joomla 1.5, so you need to delete your current Joomla installation and install Joomla 1.5 instead of Joomla 1.6. Afterwards you can use the post here to help you install your Joomla 1.5 template. Then you will need to activate your Joomla 1.5 template – see the post here. I followed yours instructions with the deals plazza quickstart template and didnt work, then i do same with deals plazza and you can see that something is wrong. Did you follow all the deals plazza setup documentation already? If so, and you need more help – you will need to contact TemplatePlazza support forum for more help about the template. Should I use hosting domain or VPS to build up my site? My site intends to serve around 3.000 to 5.000 visitors a day. Which one is easier to administrate and maintenance? Hi Loi, I have never used VPS so I cannot comment on whether which one is better. I do prefer Fatcow.com they are extremely easy to use. They have small business package which reliable. On top of that you have unlimited bandwidth, storage, email and 24×7 support with a money back guarantee. I think all these offers combined make Fatcow.com a pretty reliable webhosting provider. If you don’t live in the states/canada, you can also look into Godaddy webhosting services. Can I translate this template in another language? The modules is included in template or I have to buy them separate? If you need DealsPlazza template support you will have to contact the TemplatePlazza support team. They have a support forum for pre-sales. They have expert there that will answer your questions. and also how I can change the money, here in Brazil is R$ and not $. Wow, your deals site looks really cool. If you need deals plazza template help you will need to contact the TemplatePlazza support team. They can better answer your questions. I have few questions before I purchase the hosting website and the template. 1) When you goto Groupon.com, it asks for your email address before you get to look at the deals. Is this possible? 2) And are people able to register and make their own account and look at their payment history, and deals bought, etc? 3) Is it possible to give these customers points for purchasing deals? 2) Can I add korean to the website? 3) May I add live chat? 4) Can the business owners (ex: restaurants) log in to edit their ad? 5) Can I edit the feel of the template? 6) Do I control everything from fatcow.com? For template support, you will have to contact TemplatePlazza support team. They have a support forum for pre-sales questions. They will be able to answer your questions. As to the Fatcow question, you would install Joomla 1.5 in your web hosting and then use your Joomla installation to control your website. What does the consumers take to the restaurants to prove they purchased the coupon through me? Is their a real validation for that where it is impossible to duplicate? Hi David, Same for this question. Please address them to on the TemplatePlazza support forum. They will be able to answer your questions. Please contact the TemplatePlazza support team or ask a question in their support forum if you need detail information about the template. They will best answer your question. Such great information you have here. Thanks. I have a simple question here. Which one is best to build a site like groupon? WordPress or Joomla or Drupal? Does anyone know if there is any Live Sites using the Deal Plazza template from TP? I was wondering if I could configure the top menu (Search US bij state/ Select your city) with this template. Now it is a dropdown-menu. How can I do this? Looking forward to here from you. Thanks! You will have to contact the theme provider to ask theme specific questions. They have a pre-sale forum where you can ask questions and experts can better answer your questions. I am just wondering, is templatic website different from deals plazza? Sorry, i’m just a newbie. Templatic site is different form Dealsplazza. Dealsplazza is a Joomla 1.5 template by TemplatePlazza. I don’t recommend that though. From what I’ve heard the service is not that great. Templatic provides all WordPress Themes. Thanks for the info. I’m thinking about purchasing a template from either the templatic site or groupdealsplugin.com. Do I still need to install joomla for wordpress? We are looking for consultant to advise us on best (such as groupon, etc…)daily deal site script, software, template. Our concept will be slightly different so customization is possible. Could you plz point us to the right direction? I love this theme and am trying to set up a Groupon clone site for local businesses. My problem is that I can’t change the tagline (where it says: “People would normally want to add a SEO / copy here. And it will go with a nice tagline, subtitle or whatever. Just below the main copy.”) On Templatic site it says it’s in the theme options SEO section but I’ve changed that with no change to the site. I’ve just spent hours searching for the answer and going through the theme’s files. Then you can expand the text box that says “People would normally want to add a SEO / copy here.”. Hope that helps. I can create a post for you if you are still having problems later. nice templaste, oes anyone know if there is any Live Sites using the Deal Plazza template from TP?